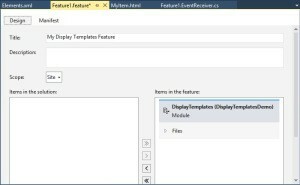 We create more and more display templates as soon as we utilize Content By Search Webpart or Search Result Webpart in SharePoint 2013. The recent project that I’ve done includes authoring (internal) site and publishing (external) site through Cross Site Publishing. Since the publishing site is customer facing / external site, we use display templates heavily and I think we have around 90 display templates. As you noticed above, I’ve specified CrawlerXSLFile property. Basically this is required for Search Engine Optimization, to allow search crawler to crawl content inside your Content By Search Webpart/ Search Result Webpart. You could read great post from Waldek here. 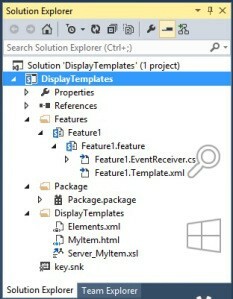 This is same thing like we did when we would like to customize Content Query Webpart in SharePoint 2010. /// This class handles events raised during feature activation, deactivation, installation, uninstallation, and upgrade. /// The GUID attached to this class may be used during packaging and should not be modified. 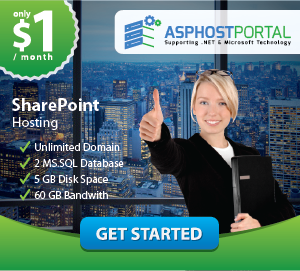 This entry was posted in SharePoint 2013 Business and tagged best and affordable sharepoint hosting, best and cheap sharepoint 2013 hosting, best and reliable sharepoint hosting, cheap sharepoint 2013 hosting, Excellent SharePoint 2013 Hosting, great sharepoint 2013 hosting on January 21, 2015 by Micah Richard.